News in Brief: Who will host European club finals? 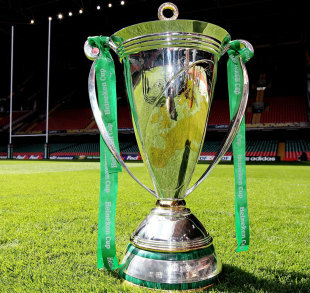 European Rugby Cup (ERC) officials have confirmed that the Millennium Stadium in Cardiff will host to the 2013-14 Heineken Cup final. The Welsh Rugby Union (WRU) launched a bid to stage European club rugby's showpiece event last month after the French Rugby Federation (FFR) withdrew its offer to stage the game due to uncertainty over the availability of the Stade de France. The title-decider, scheduled for May 24, will be the seventh to be staged in Cardiff and the first since Leinster saw off Northampton in 2011. The Welsh capital will also play host to the Amlin Challenge Cup final with that game set to be played at the home of the Cardiff Blues - the Arms Park. The second-tier tournament will be the first to be decided on an artificial pitch with the Blues currently in the process of installing a new hi-tech surface. The WRU saw off competition from the Rugby Football Union and Scottish Rugby Union to host what will be the last Heineken Cup under the current agreement between European stakeholders with the long-term future of the competition still shrouded in uncertainty. ERC chief executive Derek McGrath said: "With fans from all corners of Europe set to travel to Wales next May, we see Cardiff as a hugely appealing setting for the finals weekend which has developed into one of the great events in Europe's sporting calendar. "We will be working with the WRU, the Welsh Assembly Government, Visit Wales and Cardiff City Council to ensure that all supporters will enjoy a thoroughly positive experience. Cardiff has been the setting for some of the great finals in the past and in many ways, European club rugby is returning home. I have no doubt that the 2014 weekend at the Cardiff Arms Park and the Millennium Stadium will be yet another celebration of all that is good about European club rugby." Tickets for the finals will go on sale in early September and WRU group chief executive Roger Lewis has predicted another memorable weekend on and off the field. "We know from experience that it will be a fantastic rugby occasion and a great opportunity for Cardiff and Wales to welcome tens of thousands of supporters. "We will work closely with Cardiff Council and the Welsh Government to make this yet another great event which will deliver millions of pounds into the wider South Wales economy and this is great news at this challenging economic period in our history. "There is something special about a Heineken Cup final and our events team at the stadium has a well-deserved reputation for ensuring that we deliver a spectacular atmosphere."